If you have a message to send to many people via email that you want personalized for each recipient, use mail merge. You can create a batch of personalized email messages that are formatted identically and use the same text and graphics. Only specific sections of the email message vary and are personalized. Mail merge—unlike broadcasting a message to a group of people—makes each recipient of the message the sole recipient. This document is your email message, it contains text and graphics (a logo or image, for example) that are identical for each version of the merged document. This document contains the data that is used to populate information on the letter. Your mailing list has names, for example, and your main document is the email message that will be addressed to the names in your list. This document is a combination of the main document and the mailing list. 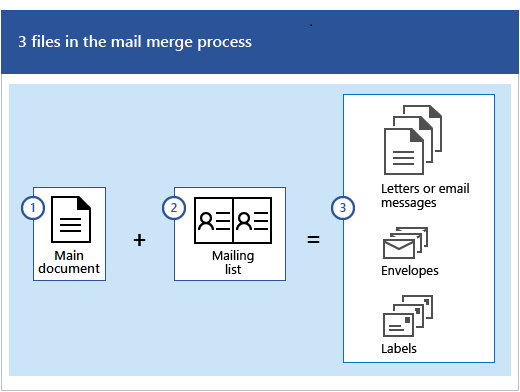 Mail merge pulls the formation from the mailing list and puts it in your main document, resulting a personalized, merged document for each person on the mailing list. 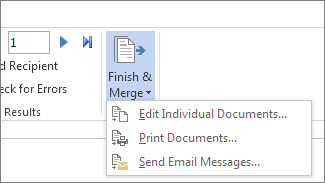 Type the body of the email message you want to send to everyone in Word before you begin. If you’re telling people about an upcoming event, for example, include the name, date, time, and location of the event. Those event details are important for everyone to know. On the Mailings tab, in the Start Mail Merge group, choose Start Mail Merge > E-mail Messages. In order to send emails, a MAPI-compatible email program like Outlook or Gmail needs to be installed. If you're using Outlook MAPI, make sure your versions of Word and Outlook are the same. The mailing list is your data source. It can be a directory of Outlook contacts, an Access database, or an Office address list. It contains the records that Word uses to pull information from to build your email messages. If you don’t have a mailing list, you can create one during mail merge. Before you start the mail merge process, collect all of your data records, and add them to your data source. See, create a new list in Word. Now it’s time to choose your recipients from a data source (an address list). Make sure your data source has a column for email addresses and that there's an email address for each person you’re sending the email to. 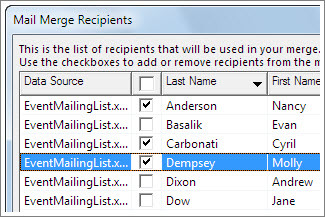 On the Mailings tab, in the Start Mail Merge group, choose Select Recipients, and then choose an option. If you don’t have a mailing list, choose Type a New List and create one. If your mailing list is in an Excel spreadsheet, an Access database, or another type of data file, choose Use an Existing List. Then browse to your list and choose Open. If you’re using your Outlook contacts, choose Choose from Outlook Contacts. In the File name box, type a file name, and then choose Save. If you’re sending email messages to everyone on your list, go to Step 4: Add personalized content to the email message. If you want to send emails only to certain people on your list you can narrow the list, use the steps under Edit your mailing list. Check the names of the people who you want to receive your email message. You also can sort or filter the list to make it easier to find names and addresses. Personalize each email message by adding a person's name and address. The best practice for adding these details is to insert merge fields in your main document. On the Mailings tab, in the Write & Insert Fields group, choose Address Block. 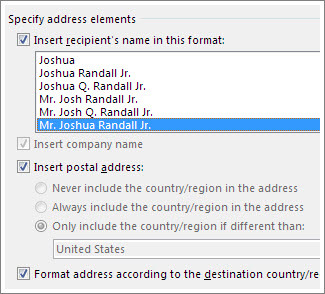 In the Insert Address Block dialog box, choose a format for the recipient's name as it will appear in the email. Choose OK to insert the merge field. In the Write & Insert group, choose Greeting Line. In the Insert Greeting Line dialog box, choose the format you want to use. Choose File > Save to preserve your email. Note: You'll need to format your email manually after inserting fields. You can also add other fields from your data source to your email message. For more information, see Insert mail merge fields. Make sure Word finds the names and addresses in your mailing list. On the Mailings tab, in the Write & Insert Fields group, choose Match Fields. Tip: Merge Fields also can be opened from the Insert Address Block dialog box you used to add an address block to the main document. In the Match Fields dialog box, verify that the record fields that appear in the list match the names of column headings for records in your mailing list data source. Note: There are two columns in the dialog box. The left column is a list of common names in a business record for example. The right column is the field name for the common name that is mapped to a column heading in your data source file. If the field names shown match column headings you used for records in your mailing list data source, do nothing. If (not matched) appears in a field name that you expected to match a column heading in your data source, choose the drop-down arrow, and then choose the field name in your mailing list data source. Repeat as necessary. To change the font, size, or spacing of the merged content, select the merge field name and make the changes you want. 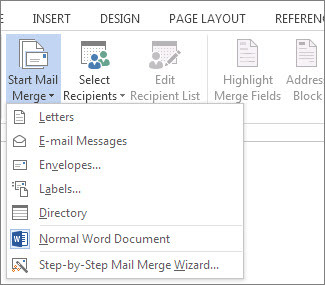 On the Mailings tab, in the Preview Results group, choose Preview Results to switch from the merged results back to the mail merge fields in your letter. Choose the merge field name. On the Home tab, choose the font and the font size you want to use. On the Page Layout tab (Word 2013) or Layout tab (Word 2016), choose the paragraph spacing you want. Note: Because Word treats each line in an Address Block as a paragraph, you might want to reduce the spacing between the lines. After you add merge fields to your main document, you’re ready to preview the merge results. When you’re satisfied with the preview, complete the merge. Choose Preview Results, and then choose the Next or Previous record button to make sure the names and addresses in the body of your letter look right. Tip: To go to the start of the list, choose the First record button, and to go to the end of the list, choose the Last record button. Choose Finish & Merge > Send E-mail Messages. In the To box, choose the name of the email address column in your list. Note: Word sends an individual message to each email address. You can’t Cc or Bcc other recipients and you can’t add attachments to the email. In the Subject line box, type a subject line for the message. In the Mail format box, choose HTML (the default setting) or Plain text to send the document as the body of the email message. Important: If you send the email message as Plain text, the main document won’t include any text formatting or graphics. Accept the default setting to merge and send All records. Choose Current record and only the record viewable on your screen is sent the message. Choose the last option, and in the From box, enter the record number to begin the merge, and in the To box, enter the record number to end the merge. Note: An email is not sent to anyone with a record number excluded from the From-To range. Choose OK to run mail merge. Save the email message if you plan to use it for another mail merge. When you save the main document, you also save its connection to the data source you chose. The next time you open the main document, Word prompts you to choose whether to keep the connection to the data source. If you choose Yes, the document opens showing information merged with the first record. If you choose No, the connection between the main document and the data source is broken. The main document for the email becomes a standard Word document. If you have a letter to send to many people via email that you want personalized for each recipient, use mail merge. You can create a batch of personalized email messages that are formatted identically and use the same text. Only specific sections of the email message vary and are personalized. Mail merge—unlike broadcasting a message to a group of people—makes each recipient of the message the sole recipient. This document is your email message; it contains text that is identical for each version of the merged document. This is the data source, often an Excel spreadsheet, that is used to populate information in the email message. Your mailing list has names, for example, and your main document is the email that will be addressed to the names in your list. This document is a combination of the main document and the mailing list. Mail merge pulls the information from the mailing list and puts it in your main document, resulting in a personalized, merged document for each person on the mailing list. A first step in the mail merge process is to create a main document. On the Mailings tab, choose Start Mail Merge > Email Messages. In Word, type the email message you want to send to everyone. The first row in your Excel spreadsheet is the header record. Each column in the row has a label name that indicates a category of information. For example, your column labels might be email address, name, street address, city, state, and postal code. Each subsequent row contains a single record of data for each recipient. There must not be any blank rows or columns in the list. Tip: To make an Excel spreadsheet of your Outlook address book, export the contacts to a tab-delimited (.txt) file, and then open the .txt file in Excel. For more information, see Export or manually archive Outlook items. In the first row of the Excel spreadsheet, type the column labels for your recipients. For example, in the first column, type Email address; in the second column, type First name; and in the third column, type Last name. Important: It's recommended that the first column contains each recipient's email address. In the second and subsequent rows, type a recipient's email address, first name, and last name. On the File menu, choose Save, and enter a file name. Note: Remember the location of the spreadsheet; you'll need it later to link it to your mail merge document. Save and close the spreadsheet. Note: You can't complete the merge if you don't close the Excel spreadsheet that contains your list, or if you reopen it before the mail merge is finished. On the Mailings tab, choose Select Recipients, and then choose an option. In the Edit List Fields dialog box, Word automatically creates fields for some basic information, such as first name, last name, and address. If you want to add a new field—for example, a message field—add it now, so you can fill in the field when you type the entry. Under New field name, type the name of the field you want to add and then click + (plus sign). Tip: To change the order of the fields, choose the field you want to move, and then use the up or down arrow to move the field. When all fields are set up as you want, choose Create to make a new list. Browse to the file you want to use and choose Open. Leave Cell Range blank to use the entire spreadsheet. Enter a cell range for the data you want to use. Choose Filter Recipients to select the recipients you want to include. 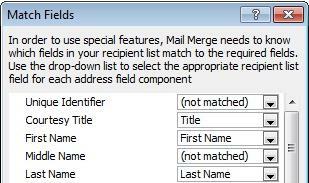 In the Query Options dialog box, next to List mail merge recipients by, choose Complete record. In the list of contacts, select the contacts you want to include in the mail merge, and then choose OK. 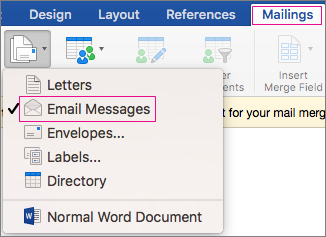 In the Query Options dialog box, under Apple Group Contacts, choose the group you want to include in the mail merge, and then choose OK. In the Header Record Delimiters dialog box, choose a field delimiter to separate each data field and a record delimiter to separate each data record, and then choose OK.
On the Mailings tab, choose Insert Merge Field, and then choose the field you want to add. In your main document, click in the Drag fields into this box or type text box, and then click the text to remove it. Add and format the fields you want to be included in the email message, and choose OK.
On the Mailings tab, choose Preview Results to see how the email messages look. Note: Use the left and right arrow buttons on the Mailings tab, to scroll through each email message. To make additional formatting changes, choose Preview Results again, which lets you add or remove merge fields. When the messages look how you want, on the Mailings tab, choose Finish & Merge > Merge to E-Mail to complete the mail merge. Tip: Merge to E-Mail is unavailable if you have not selected your default email program.